One Mom's Moxie: Sports You Probably Haven’t Tried. With the 2012 Olympics in full swing nearly everyone is thinking about sport. All those muscled bodies may leave the rest of us feeling a little inferior but there are plenty of sports out there which will leave you feeling fitter and, with a little work, ready to compete in Rio 2016! (The publishers are not liable for failure to qualify for your Olympic squad!) By looking online you can quickly find a club near you and you may be surprised at the number and varieties available. Below I give my favourite few alternative sports. 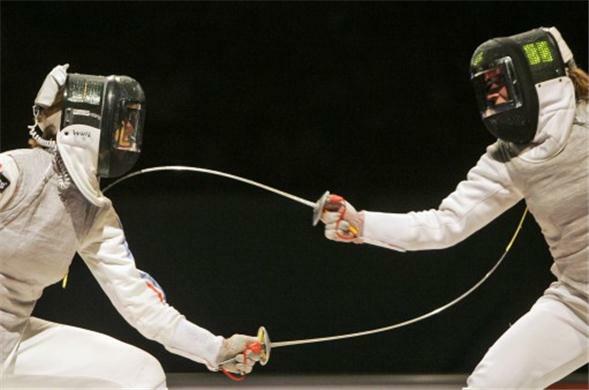 Fencing – Two people hitting each other with swords, what’s not to love?! In all seriousness, fencing is great fun and accessible to any age and any ability. Many clubs take children from an early age and teach them using foam swords as well as normal protective equipment. Older competitors will progress onto the three different swords (foil, epée and sabre) and there is plenty of opportunity to take part in competitions at a regional or national level. The sport is great fun and, whilst not too demanding physically, it does give a good workout with increased muscle toning and flexibility soon noticed. Look online for a local club; they are often found at schools or community centres and meet weekly. Handball – Fun, fast and furious, this cross between basketball and football is probably older than both! Extremely energetic, this sport will have you running about and burning calories in each of its two thirty minute periods. Action is intense, with high scores common, meaning that you won’t ever suffer from boredom during play. Small teams of seven on each side also mean that you are guaranteed being passed the ball and having your chance to go for goal. The sport is beginning to pick up popularity around the globe so there really isn’t a better time to get involved. Look online for your country’s national association which will have a list of clubs near you. Synchronised Swimming – One of only two events which only women can compete in at the Olympics, this sport requires both grace and a surprising amount of strength as well as the ability to hold your breath for long periods of time. However, the rewards are many; improved fitness is just the start with many competitors citing the close bonds of friendship as being the best thing. Having to work in a team and achieve perfect choreography is an experience that brings those taking part much closer together. There are a surprising number of clubs popping up all over the world and the best place to find out more is to pop round to your local swimming pool and ask for details. Whatever you decide to take up, being active and working with others will help you to feel both happier and healthier. All it takes is a little work and you will soon find something you love that you never would have guessed about before. If you are looking for some great savings on equipment then click here.